TORONTO/LONDON (Reuters) - Anglo American unit De Beers <AAL.L> is going after lucrative, but elusive high-tech markets in quantum computing, as it aims to expand its lab-grown diamond business beyond drilling and cutting. Element Six, De Beers' synthetic diamond arm, is building a $94 million factory in Portland, Oregon, an expansion that comes as scientists from Moscow to London push to develop diamonds for futuristic applications. Researchers have long chased the synthetic 'holy grail' of diamond semiconductors, without commercial success. Now coming of age after decades of experiments, technology called chemical vapour deposition, or CVD, offers a path to higher-quality, lower-cost production of synthetic diamonds and that opens the door to potential new computing markets. The global synthetic diamond market, from jewellery to medical equipment, is forecast at $28.6 billion by 2023, up from around $15 billion in 2014, according to Crystal Market Research. Other companies in the sector include Russia's New Diamond Technology, Singapore's IIa Technologies and U.S.-based Diamond Foundry. CVD technology brings that closer to reality, said Anirudha Sumant, a scientist at the U.S. Department of Energy's Argonne National Laboratory in Illinois. This year, some 2 million carats of gem-quality synthetic diamonds will be produced, versus approximately 60 million carats of gem-quality natural stones from 148 million carats mined, said industry analyst Paul Zimnisky. Element Six, which produced its first synthetic diamond in 1953, will also use CVD for the Lightbox line, jewellery with polished synthetic stones priced at $800 per carat. 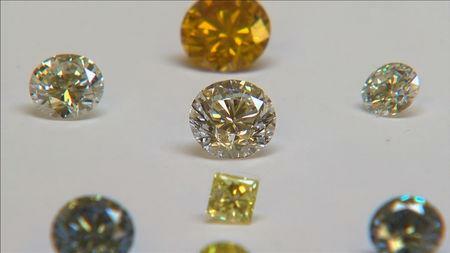 It targets annual production of 500,000 rough carats by 2020. De Beers abandoned its policy of strictly selling natural diamonds for jewellery in May, a U-turn that it said reflected consumer demand. The shift coincides with challenges for diamond mining. Prices for natural rough diamonds are about 20 percent below record 2011 highs, while synthetic production costs are dropping.